Sent messages just for me! Haven't seen many calling birds lately, but thinking that I will focus today's challenges around CALLING. Whom do you hear from around the holidays? How do you keep in touch? Cards? Letters? Phone calls? Messages through social media? Create a page or card on which you use the word HELLO! Bonus point if you add a telephone icon, or a post card image, orr include a screen shot of a holiday message or conversation. Share a photo of letters or cards ready to be posted to friends and family. Create a page with a copy of your annual Christmas letter, either in whole for everyone to see, or tucked into an envelope. Or has a child in your life written a sweet letter to Santa? Or do you have a letter from when you were a child. Hey: why not write a letter to Santa, asking him for something you would really love to receive this holiday season? Create a page with cards you have received in the past from family &/or friends. Tell a story about what you enjoy most about giving and receiving holiday greetings. (You know double dipping is allowed, right? So you could include this with the cards from the prompt above for double points. One last prompt: put FOUR of something on your project: 4 photos, 4 word title or greeting, 4 snowflakes or stars... And hey, why not 4 birds? Whatever you create, please share it with us in this thread. 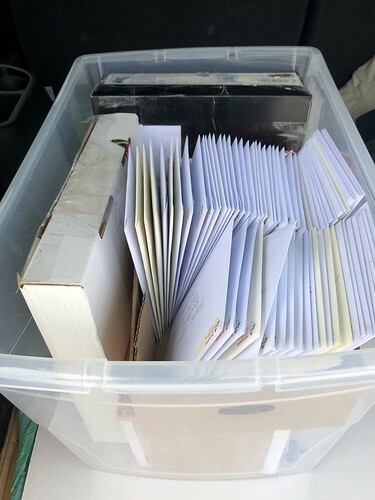 Didn't get a chance to create anything for tomorrow's prompt, but I do have a photo of the bin of cards and gifts off to the post office this morning. Wow grammadee, loads of cards to post! Here are some cards that are ready to go - 4 of them, in fact. They're for my friends who have fur babies. I got the stamp from SSS during their own-brand sale over Thanksgiving. 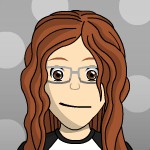 I love it with the rounded square frame. The sentiment is from the same little stamp set. and more cards on their way out the door... some for Peas, some for friends and family. 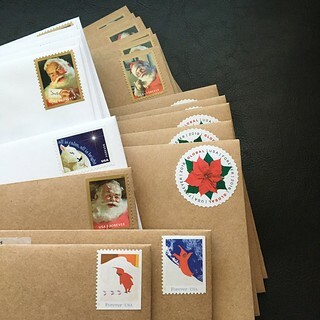 I got a really nice selection of postage this year. The Snowy Day book stamps are for my library friends. 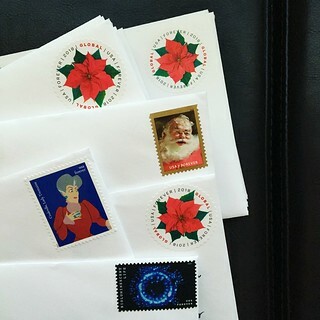 I try to match the stamps to the person I'm sending to, if I can. I loved sending female friends the Wonder Woman stamps. 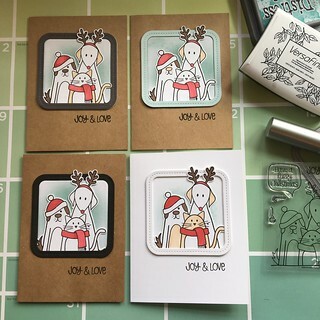 Fab fur baby cards joblackford! I love those, so cute and perfect! Your stamps on the envelopes look awesome too, clearly stinkerbelle needs to get some wonder woman stamps hahaha! 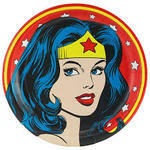 ooh i would love wonder woman stamps! but i'd have to hoard them forever! Wow stinkerbelle, amazing LO, I love all the embellishments, they're fabulous! Everything looks awesome, great photos too, a wonderful LO! Ok I have been so inspired by all the lovely cards that I decided to give it a go. This is my first ever handmade card. I actually made it a few weeks ago but haven’t sent it 😬. It fit this challenge perfectly! What a cool card, joyfulnana! Love the colours. I predict you will be turning out cards like crazy in the very near future! Great card joyfulnana ! I loved that Hello collection and it looks great as a card for sure! I really enjoy making cards. To me, sending a home made card to someone is my way of saying they are important to me. This picture is of the back of a bunch of my cards. I made the "Homemade" stamp on my Silhouette Mint. This is the first stamp I made but it will not be the last. Oh wow stinkerbelle, the papers you've used are so lush but that brad border, holy wowzers! It's amazing and beautiful and I want to run my fingers over it, so cool! Glad you decided to given it a go! You seem to be a natural. Yes! Wow stinkerbelle, that's amazing. Way to use some stash too! 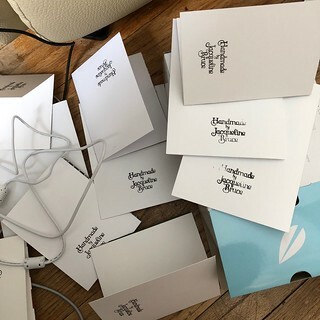 I made a page this morning about the cards I made and sent this year. I'm also including a ton of cards we've received in my JYC album purely for their decorations. Awesome LO joblackford and it's a great photo too, I love it! That page is great joblackford! I just love that line of paper it one of my favorites of this season.